What inspired you to run for elected office? DAN: I felt my background in business management and tools were well suited to help solve and operate the county properly. Serving the people of Bonner County is just another service position in the long line of community services that I have a passion for. Besides political experience, what unique qualifications would you bring to office that no one else could match? DAN: The County is similar to a large corporation with 425 employees, 35 departments and a $57 million budget. Having the ability to function as a CEO in this environment requires very specific abilities and experience. I have that experience and have proven it in my first year in office. What are the most important issues facing the county? What are your solutions? DAN: Fiscal responsibility. I have already shown the ability to properly manage the budget with our budget cuts of $8,799,201 from the previous budget. Efficiency would be second and we have already made some fantastic changes in that area. Customer Service, treating the public we are here to serve like we would want to be treated. Again, we have already made changes in this area and credit goes to the employees of the County for their hard work. What role do you think Idaho should have regarding the proposed silicon smelter in Newport, Wash.
DAN: Bonner County has no authority over a facility in another state. Idaho DEQ, however, does and I know they are involved. What are your thoughts on the proposed Scotchman Peaks Wilderness Area? DAN: I oppose the current plan. I am for multiple legal use of all public lands and believe the land should be open to all of the public. I have no issue with special use designations however when studying wilderness and its detrimental effects on both wildlife and timber management and health, I feel that the majority of that area is better served being properly managed. How do you foresee your typical workday as an elected official? DAN: The typical work day brings all kinds of issue to my office. Everything from contract negotiations, project management, employee issues, budgeting, spending, dealing with both state and federal entities and looking out for the people and the culture of Bonner County. It’s a multi-faceted job that requires a great deal of experience in a number of areas. This job is not an 8 – 5 position. As most people have seen, outside of normal office hours, I attend evening and weekend meetings and take calls in my off hours. What issue is not being given enough exposure in your race? DAN: We are spending too much time talking about things that are out of the Commissioners control and not enough about what it takes to properly perform in the position of commissioner. The commissioners position is less ideological and more about running a large corporation and doing it properly. We have seen the detrimental effects from those in the past that may not have been up for the challenge. If you could only get one thing across to voters during your campaign, what would it be? DAN: I made specific promises two years ago during the last campaign, I completed each of those promises by August of last year. I am continuing to work on repairing the fiscal financial position of the County, getting it back to a responsible place. 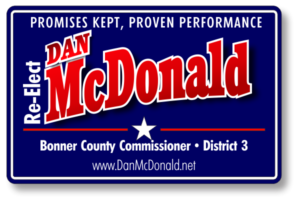 I have provided proven performance that will continue to benefit all residents of Bonner County. What are your thoughts on a proposed second railroad bridge across Lake Pend Oreille? DAN: I support it as it will help reduce the bothersome wait times we currently experience. This affects residents going to and from work as well as EMS and Fire and will reduce the number of trains idling and blocking intersections. What question should every candidate be asked? What is your answer? DAN: The county commissioners campaign is really a job interview. More questions regarding a candidates ability to run a $57 million corporation with 35 departments and 425 employees is far more important than the candidates position on the Smelter, Scotchman’s or the railroad bridge. I have proven I have the ability and possess the proper tools to serve the residents of Bonner County.